Eating the right foods and working your muscles like they were created to be used is paramount to anyone whose objective is to live a long healthy, vibrant life. However, the job doesn’t stop there nor does it start there. Just as a coin is “two sided”…you are also “two sided”…you have inner mind that must be kept healthy just as you have your outer physical body that must be kept healthy. They work as a team. If one is in chaos, the other one won’t be working at peak performance. Without a doubt, addressing your muscles needs and your diet goes a long way to fulfilling the needs of your outer physical body, but, if you don’t address your “inner” mind’s needs at the same time, you are facing an uphill battle because you’ll be fighting off your inner demons that are directly responsible for the “stressors” in your life. Truth is, our inner mind needs really trump our outer needs because they are the driving factors. In other words, you cannot truly achieve any kind of lasting physical health if your mind is in chaos. Simple as that. Just as there are physical tools to help you create the physical, healthy body of your dreams, there are also “mind” tools that can help you transform your thoughts from lower “fear” laced frequencies that bring on stress to healthier “love” based frequencies that foster health. In our hectic modern daily schedules, we come up against stress on a daily basis. It may come in the form of a stressed relationship, bank account, trouble at work, issues with health…there are any number of stressors that could be counted. Stress originates in the mind (and settles into your muscles and organs) and just like our other muscles and diet requires attention if we are to experience stellar health, so too does our mind. Many people use some form of meditation to achieve a balanced peacefulness within and deal with stress. Meditation is an excellent tool to help you to remove yourself from your chaotic thoughts (the ones that are stressing you out) and get your mind focused on a single thing. (A scattered mind is one that will work against your health because it scatters your energy into too many channels.) Meditation gets your mind energy focused and that’s where the power comes in. Once you can corral the power of your mind to focus on one thing, you can take this “power” into the real world and eliminate negative thoughts (nip them in the bud) in “real-time” when they come knocking at your mind-door and keep your mind focused and centered on the positive. Yoga is one such empowering tool. 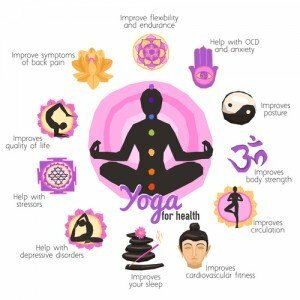 The biggest difference between using traditional sitting meditation techniques and using yoga for meditation is that yoga also involves more physical movement whereas meditation is done while sedentary. Yoga helps us slow down and tune into one thing, the breath. It not only improves flexibility but is an excellent tool to relieve stress and comes with a whole host of benefits that improve mindset. Not all yoga poses are created equal though. Certain yoga poses (asanas) release stress and tension in different ways (and in different areas of the body), addressing and helping certain parts of the body. To help quiet the mind and ease stress and anxiety, the calming resting posture of the “Child’s Balasana pose” is an excellent choice. So too is the “Eagle” and empowering “de-stressing” pose. It does require focus in order t to remain balanced as you literally squeeze the tension out of your body. Your shoulders, legs and back all benefit. The “Corpse” or Savasana pose is another relaxation pose that is often used at the end of a yoga session. It slows the breathing, lowers blood pressure, triggers a relaxation response and encourages the body to come into a more restful state. benefit – it slows the aging process. Those who enjoy yoga on a regular basis have created a strong mind-body connection and are more in touch and at-ease with their own bodies…their own selves. Using yoga as a form of meditation has made them are aware of how their thought processes influence the state that their body is presently in. This is empowering. Using yoga, you’ll experience improved flexibility, enhanced core and muscular strength and an increase in balance and agility. But the real benefit is how it empowers you and puts you in touch with your mind.